Follow on, comrades, we are the modern-day Magellans and we do it with speed. We wrote more than a dozen posts on China’s growing appetite for luxury last year. Few things surprise us anymore. Then we saw this: a 66-day around-the-world tour that sold out in China 13 seconds after the reservation hotline opened — roughly the time it takes Olympic-champion hurdler Liu Xiang (刘翔) to cover 110 meters. Did we mention the price? The cost of the whole trip is a whopping RMB 660,000 (US$104,654), about eight to 10 times the annual salary of an average Chinese. The tour — which takes in more than a dozen countries and both poles — is organized by Ctrip.com, one of China’s biggest online travel agencies. News of the fast sellout was confirmed to us by Jack You (游金章), general manager of Ctrip’s high-end package tour department. You said the eye-catching package was sold last June through Ctrip’s hotline. After a half-year visa application process, the group took off from Shanghai on January 29. Yet even as the high-fliers’ luggage was being loaded, 30 wanna-be travelers whose names were on the waiting list, were hoping against hope for last-minute drop-outs. "The current 11 group members were the first 11 to call in on our day of sale,” said Taiwan-native You. Ctrip claims to be the first in China to mastermind such a trip. The company did not reveal the reason for using 66 in the price and length of the tour. However, six is considered a lucky number by Chinese, a word that also stands for "smooth." 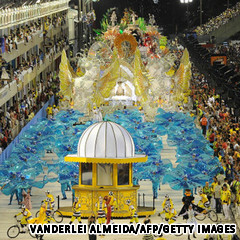 The global-trotting tour group will make a stop at Carnival in Brazil. Led by Hong Kong-born trilingual tour guide, Thomas Lee, the group’s first stop is Australia, followed by a 24-day tour in South America, highlighted by a cruise from Ushuaia to Antarctica with the cruise line Silversea. The intrepid travelers will then cut through North Africa and Europe, where they’ll hop on a 10-day cruise in the Mediterranean, dine like kings in Michelin-starred restaurants in Paris, and watch the Aurora Borealis in Finland’s glass-ceilinged Kakslauttanen hotel, to name just a few activities. The 11 globe-trotters are slated to spend their last week on tour in Dubai, India and Hong Kong. They’ll return home on April 3. The Magnificent 11 are flying business class for most of their odyssey, and will stay in top-of-the-line hotels, including the Burj Al Arab in Dubai. All of the activities and attractions on the tour were chosen from the most popular items in Ctrip’s various overseas packages. One of the biggest problems in planning the tour, according to You, was to time seasonal events, such as Brazilian Carnival, and to secure local rooms, flights and tickets. This is the second year Ctrip has organized its megabucks around-the-world trip. The Shanghai-based company put together a similar tour in 2010, which lasted 50 days and cost RMB 600,000 (US$95,140). "Chinese tourists have long been interested in traveling abroad, but now they want more enriched and varied experiences in different countries and continents instead of just settling on one or two places," Yu Lan (俞岚), director of overseas travel for Ctrip, told Global Times. The tour group is made up of mainly local travelers aged around 40, though You pointed out that the company also received applications from overseas Chinese based in the United States. The online travel agency is looking to double the headcount of the 2013 around-the-world tour and will open applications in March. The Global Times has reported that 20 people are already on the waiting list for next year’s tour, so the race of booking can only get more fierce next time.